Talbot House & Talbot Studio01931 712067work Self-cateringRomantic Lakeland stone cottages offering spacious accommodation ideal for families or groups. 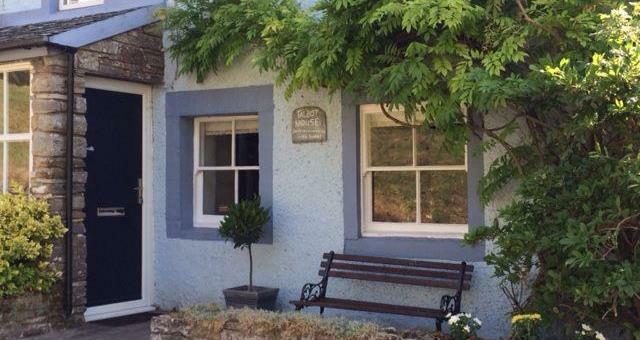 Talbot House sleeps 5 and Talbot Studio sleeps 2, book separately or as one. They share a terraced garden with BBQ and seating area. No smoking allowed, well behaved pets welcome. Talbot House, with original beams and an open fire, sleeps up to 5 people in 3 bedrooms, 1 king, 1 twin, 1 small single. The lounge and dining room, look out onto Helton village green while the well equipped kitchen has views to the river Lowther. The fully tiled bathroom has a bath and electric shower. Talbot Studio is a generous cottage for a couple. An oak kitchen with dining facilities and fully tiled bathroom beyond. Up the spiral staircase is a large lounge with spectacular views to Knipe Scar. A super king bed with built-in bedroom furniture is in a spacious area adjoining the lounge. We offer secure parking for cars and storage for mountain bikes or small boat, as well as shared laundry facilities. Both cottages have central heating, dishwashers, TV and DVD. Holiday prices include bed linen towels heating and electricity. Talbot House & Talbot Studio offers weekly bookings starting on Friday and sometimes short breaks. Three bedrooms, 1 king, 1 twin, 1 single, open fire in lounge. Oil fired central heating .Shared utility room with washer/dryer. Shared garden . Talbot House offers weekly bookings starting on Friday and sometimes short breaks. Downstairs - kitchen/diner, bathroom and shared utility with washer/dryer. Up spiral staircase to lounge with spectacular views. Double bed in spacious alcove. Talbot Studio offers weekly bookings starting on Friday and sometimes short breaks. Very cosy house in a picturesque setting. Romantic Lakeland stone cottages offering spacious accommodation ideal for families or groups. 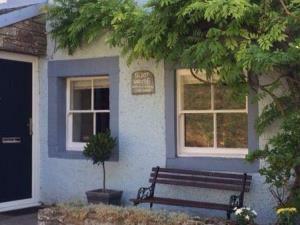 Talbot House sleeps 5 and Talbot Studio sleeps 2, book separately or as one. They share a terraced garden with BBQ and seating area. No smoking allowed, well behaved pets welcome. Set in the beautiful conservation village of Helton; 1 mile from Askham, within the National Park, with views over the Lowther Valley. The fells of Helton and Askham are within a 5 minute walk. 10 minute drive will take you to the local market town of Penrith and Lake Ullswater. Helton lies on the Haweswater road. Within a mile radius we have historic buildings, public houses and 2 outdoor-heated swimming pools. Within a 5-mile radius we have cycles for hire, pny trekking, water sports, leisure health and beauty. Children welcome from any age. From M6 jct 40 follow A66 east till next roundabout then south on the A6 towards Shap. After Eamont Bridge turn right towards Pooley Bridge. Take the next left fork signposted Askham & Haweswater. Helton is 1 mile further on than Askham. Talbot Studio is on the main road on the right. From M6 jct 39 follow the A6 north through Shap to Hackthorpe. Take left turn to Askam and drive through the Lowther estate to Askham. At the top of the hill in Askham turn left and drive 1 more mile to Helton. Talbot House is on the left in the middle of the village, for Talbot Studio stay on the main road and look for mint coloured garage.